Home / Blog Post / Back of the net! The 2-IMMERSE Football production team report on the success of our major trial at Wembley. 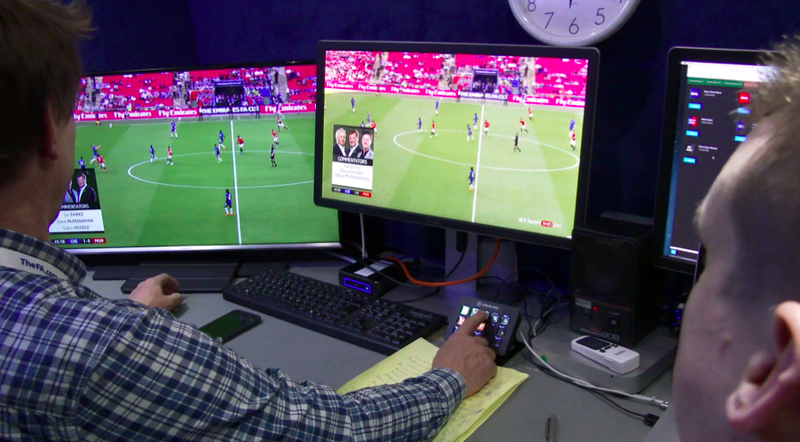 2-IMMERSE passed another milestone at the recent 2018 FA Cup Final at Wembley Stadium between Chelsea and Manchester United as we proved our prototype end-to-end live production system for object-based broadcasting to multiple screens. For those that may not know the FA Cup is the world’s oldest football challenge cup, having been started back in 1871. The high profile final is the curtain closer for the UK domestic football season and has spawned and fuelled many of the intense inter club rivalries that give the UK league its particular character. For decades the match has also been a key television moment and a showcase for experimentation and innovation in the presentation of football on television. So 2-IMMERSE is very proud this year to have been a small part of a great tradition. The FA Cup Final is a national treasure, but it also draws a global audience estimated to be in the hundreds of millions. Our team for the FA Cup was drawn from BT, CWI, Cisco, and BBC R&D – and they all worked tirelessly over the preceding weeks and months to design and develop the end-to-end system. Early ‘sighting visits’ to Wembley (see our previous blog post) helped us identify and address the key issues that can affect the delivery of the service and helped the test on the day of the Final to go as smoothly as it did. ChyronHego data capture for Virtual Placement: camera parametric data and Tracab player tracking data. In addition to the on-site achievements, and to further illustrate the end-to-end nature of the trial, we engaged 10 remote viewing participants in UK, Sweden and the Netherlands, to experience watching our interactive, customisable and multi-screen version of the 2018 FA Cup Final. Match GFX components developed by ChyronHego and implemented using new DMApp component which integrates with their Prime universal graphics platform. Like most productions this was a massive collaboration involving people and organisations across and beyond 2-IMMERSE. We are happy to acknowledge the help of: AWS Elemental in providing real-time encoders; BT Technology Service and Operations for providing some key with contacts and helping with system design; BT Sport for permission to access the stadium and allowing our small van to take its place alongside the big trucks from BT Sport and the BBC; and to BT Sport and BT media and broadcast for providing the guaranteed upstream bandwidth we needed. The next step – or at least one of them – is to work with all the video and data captured at the Final to develop a stand-alone demo showing the capabilities of the system and illustrating the end-to-end process. 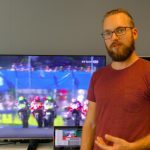 We will present this on our stand in the Future Zone at IBC 2018 in Amsterdam in September. We look forward to seeing you there.